Cable anchor has many uses in civil engineering. In geotechnical applications, it is known by ground anchor or earth anchor or mechanical anchor. It is an active in-situ soil reinforcement technique. They may be driven by impact into the ground or in a screw fashion. In soil engineering, they are mainly used for protection against slope-stability failures, vertical excavation support, resist uplift action due to water table etc. They can be used for small and large applications. The angle of internal friction, which is an empirical shear strength parameter of the soil, plays a major role in the resistance of the load carried by the ground anchor. Also, when it is installed to a greater depth, the frustum of cone of soil supporting the anchor is also large, which gives more force-resistance. Also, when small loads are applied the depth can be less. But if the load is of higher range, sufficient additional anchors (or) greater length is to be provided. The diameter of the anchor also plays a bigger part. The size and angle of the top surface of ground anchor is a useful parameter in the installation and pull-out resistance of the ground anchor. The stiffness of the wedge plate is useful in transmitting the anchor load to the bearing plate closer to the ends of the plate’s span. This prevents the bending of the bearing plate. If you have large size wedge plate, then the amount of bending of the bearing plate is reduced. Strands are useful in tying up all the cables and act as one unit. The wedge prevents the anchor part from sliding and thus keeps the ground anchor in position. Grout body is useful in maintaining a bond between the anchor and the soil. This problem arises in slope reinforcement projects. One of recent method used to calculate the above is the variable-modulus elastoplastic strength reduction method or simply called as the SRM. This method is used to obtain the stress variations, strain field, factor of safety of the slope. In this method, slope-stability done by anchor cables is modeled using surface loading. 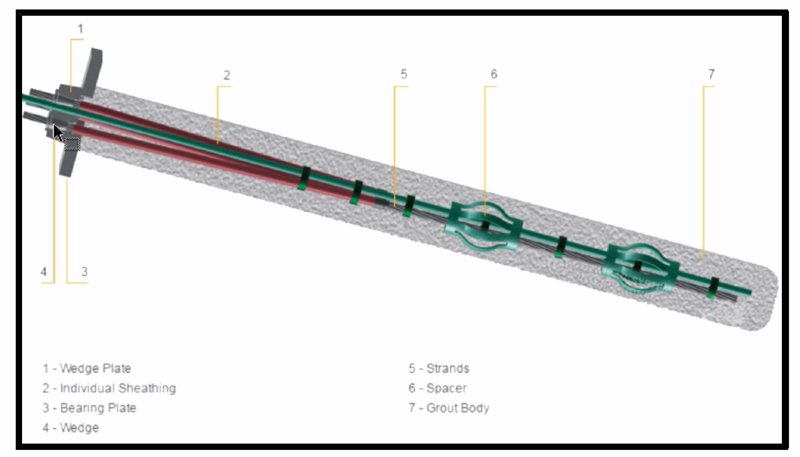 To represent the anchor reinforcement system, they are distributed in different forms of surface loading. In a study done in 2015 by Chinese researchers (http://www.sciencedirect.com/science/article/pii/S1674775515000657), it is found that, if strong anchoring is provided in the regions of high stress and large displacement, failures can be reduced. This method can also be used to identify the suitable position of the anchor cables.